If you have children and are considering taking up a place at university yourself, you may have concerns about managing your studies alongside the full-time job of parenting. Our dedicated Child Care Adviser can offer a range of support and advice. Studying and being a parent can often be challenging. Our Child Care Adviser, located in Student Affairs, is at hand to offer help and support whatever your child care requirements. Student Affairs info is available on our student portal, iCity (A university login is required). "The Child Care Adviser's help was real and professional and I hope that she will always be there for every student who needs child care help." Our Specialist Child Care Adviser can give you support on finding and choosing childcare in the UK to help your children settle in to a new country. Where possible, please inform the Child Care Adviser of your requirements before arriving in the UK. 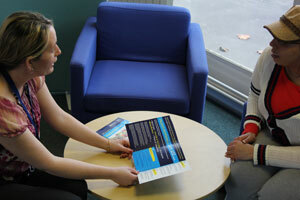 Student Affairs can also provide advice about you and your dependants’ immigration. If you would like to discuss your child care needs please contact a member of the Student Help Zone team. They can give you some information on child care options, financial advice and ideas on balancing your studies and family life. If your child care providers have let you down, our Child Care Adviser may be able to help you.